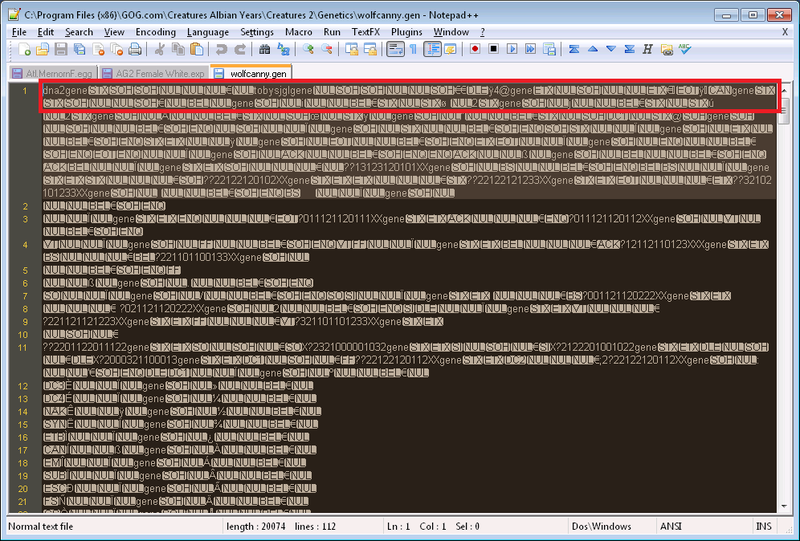 A detailed guide to extracting a usable .gen (genome) file from an exported creature or egg. Intended primarily for C2 users, this guide also works for C1 and may possibly work with C3/DS as well. I'd be interested in hearing if the latter is true! Before we begin, credit where credit is due: I learnt all of this from The Shee's Lost Knowledge article on reverse-engineering the C1 .exp file format. -- an extremely informative blog full of fascinating, detailed information. Check it out! First, I highly recommend using something like Notepad++ to edit files. Windows' own Notepad is extremely limited, and chokes when handling files over 1-2mb. So go grab it, and then meet me back here in a few, ok? 1. Using Notepad++ (or equivilent), open up the .exp or .egg file that you want to extract its genome from. 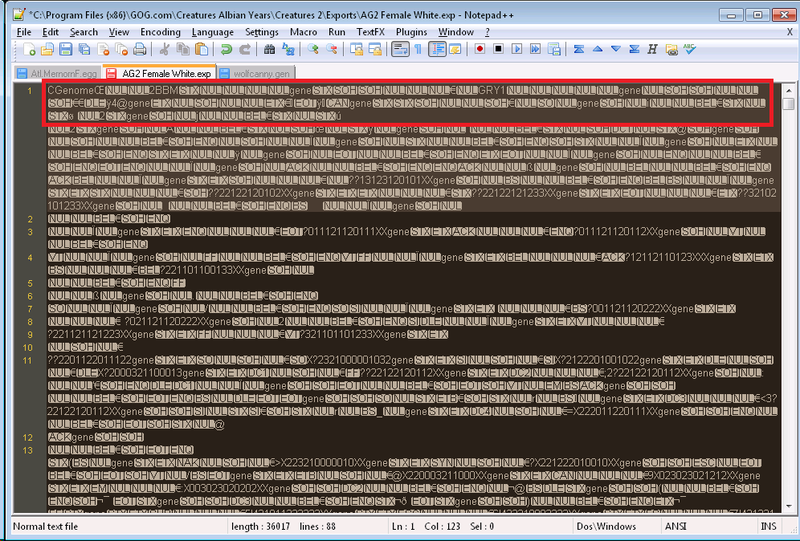 -- Before proceeding further, click the 'Encoding' menu, and make sure you're viewing in 'ANSI' format. -- If you don't find "dna2gene", search instead for "CGenome"
3. Put your cursor at the START of that word, and then highlight all previous content, until you reach the beginning of the file, and then hit delete. You should see that your file now begins with either "dna2gene" or "CGenome". 4. Ctrl+F again to find the word "gend". 5. Put your cursor at the END of that word, and then highlight all the content that comes after it, until you reach the end of the file, and then hit delete. If you did it correctly, your file should now end with "gend". 6. Now, go back to the beginning of the file. If your file starts with "dna2gene", you're already done! Save the file with a .gen extension (don't overwrite your original .egg or .exp!) and you should be able to open it up in the Genetics Kit. Test this to make sure you did everything correctly, and you may stop reading here. However, if your file starts with "CGenome", there's some additional editing to be done yet. The following is a bit tricky, but after a while, it becomes routine and easy. Just pay close attention and you should be fine! 1. First, change the word "CGenome" to "dna2gene"
And that's it! Save the file as a new .gen (again, don't overwrite your original file!) and open it up in Genetics Kit to make sure it worked. The Kit may discover and automatically fix some errors, after which you can simply re-save the file to make the fixes permanent. Updated by kezune on 3/23/2015 - Fixed a few links, shrank large images, add links to images to link to full sized versions.